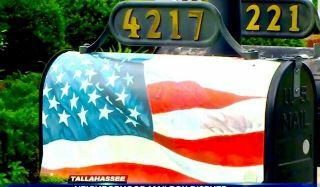 A Navy veteran in Tallahassee says he has no intention listening to his homeowners association and removing a patriotic mailbox that has been in his front yard for years. The Southwood Residential Community Association recently sent former Navy officer John Ackert a take-down notice for a stylized mailbox featuring the American flag. He says the notice, which arrived last week, is absurd due to the arbitrary enforcement of “aesthetic values” rules. “As the holiday season comes to a close, please remove the American flag mailbox wrap. Decoration may be displayed 30 days prior and must be taken down 15 days after,” the letter reads, a local CBS affiliate reported Thursday. Mailbox with flag has been there for four years, homeowner says. Mr. Ackert told reporters that he has not received a response since filing an appeal. He faces fines if his request is declined and he continues to use the mailbox.